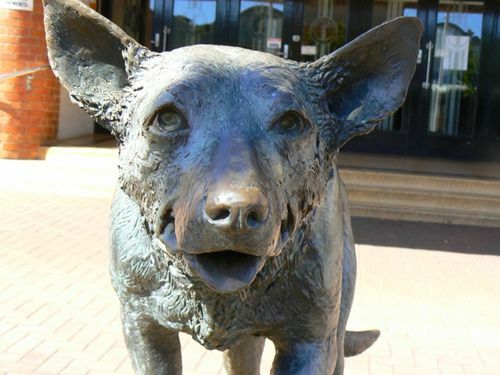 Statue commemorates the Australian working dog which originated from the intermixing of the progeny of three pairs of `Working Collies` imported into Australia by three early landholders. The foundation female, born of black and tan working collies on Mr George Robertson`s `Worrock` Station on the Glenelg River, Victoria, eventually came into the possession of Mr J.D. Gleeson, who named her Kelpie.